The World Ranking of November has brought many changes! Hervé Guillou is up to the top of the Freestyle Slides World Ranking for the first time in his career, replacing Chinese skater, Huang Hai Yang, who stayed 16 months on the first place. Here, the current world number one is sharing his feelings about his new title! "It’s a kind of crazy feeling", Herve said, "First you don’t believe it, and think it’s a joke. Then you start to realize that it’s true and it’s the moment you discover the “crazy Hervé” who is jumping everywhere, laughing and smiling for nothing. Let’s say it’s a big inside firework and a big feeling of proudness. I’m definitely not the best slider in the world, particularly when you see the Chinese skaters like Huang Hai Yang or Europeans like Rekil, Aleksey Martsenyuk and Carlos Nelson (and all the Spanish sliders). So it would be an enormous lie to say that I was expecting to be at the top of the ranking. 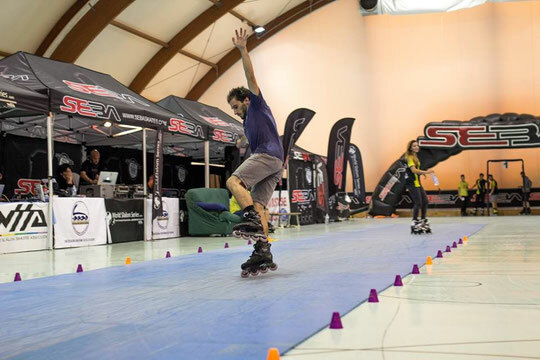 I can say that I was lucky to participate to most of the main events around the world, thanks to my sponsor SEBA who helps me and supports me since many years and my club "Chambery roller" who supports me all year long. I also had some good results particularly as the vice European Champion tittle, which brought me many points. I hope the fact of being the world number one will not change anything for me and I will stay the same guy as always: a funny guy! The only change will be the pressure I will have in the future events. Going to event with the tittle of world number one will be something new for me and definitely pressuring. Let’s say it’s time to train harder and try to keep this ranking!" Check the full rankings here!